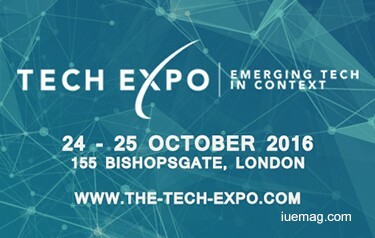 The Tech Expo 2016 taking place 24-25 October at etc Venues, 155 Bishopsgate London, looks well on its way to delivering a quality line up of speakers over six educational & engaging conference tracks. TTE promises to educate on how businesses & enterprises should be embracing advancements in Emerging Technology & Data to develop deeper solutions for customer engagement, improved operations, better experiences & ROI. Contextual Strategies Conference – Content in Context, Social Media, Real Use Cases across Verticals, Connected Home, Real Time Triggers & “Context Aware” gadgets. Contextual Enterprise Conference – Contextual Analytics, Data & Processes, Cloud, Beacons & Sensors, Virtual Assistants & AI. Immersive Tech Conference – Augmented Reality, Virtual Reality & Mixed Reality in Retail, Marketing, Enterprise, Fashion & Gaming. Use discount code TTE20 for 20% discount on our Explore & Engage Passes. Any facts, figures or references stated here are made by the author & don't reflect the endorsement of iU at all times unless otherwise drafted by official staff at iU. This article was first published here on 14th July 2016. Relations Manager is a contributing writer at Inspiration Unlimited eMagazine.